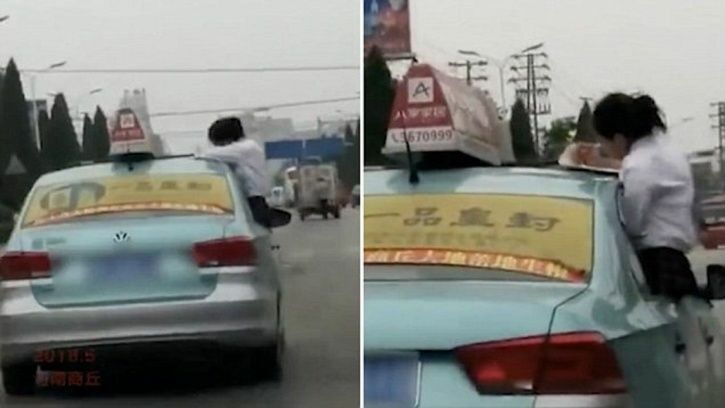 A girl in China shocked many people after she climbed out of a car’s window and started studying on the top of car’s roof. As per the driver, who also happens to be the concerned girl’s father, told that his daughter leaned-out of the vehicle while he was busy speaking to a passenger sitting next to him. While the driver was busy, his daughter pulled down the car’s window, climbed-out and sat on the car’s door with her hands on the top of the roof along with a notebook. Several passengers and fellow motorists were stunned watching the girl in that dangerous state. As per the driver, the moment he saw this, he stopped the vehicle and put his daughter back on the seat. He even spanked his daughter for doing the same. As soon as the video spread and got viral, the taxi company suspended the driver even after several appeals from his side. The driver will now be transferred to another position in the company.